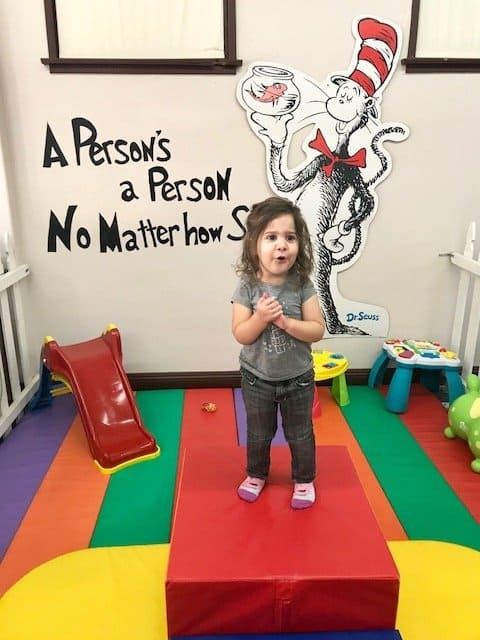 Thank you to The Village Funhouse for partnering with me on this post. You know I’m all about living simply and enjoying the sweet stuff in life. I want to spend less time organizing clutter and chaos, and more time enjoying my family and laughing so hard that we accidentally pee in our pants. So it only makes sense that I take the time to find little hidden gems around the city of San Diego for me and my kiddos to enjoy. We usually spend a lot of time at beaches and lakes, because you just can’t beat the beautiful California weather and water scene. But some days, during the scolding heat of summer and the windy chill of winter, we like to find an indoor spot to play. This week, we found the coolest hidden gem in the quaint little town of Fallbrook, California. 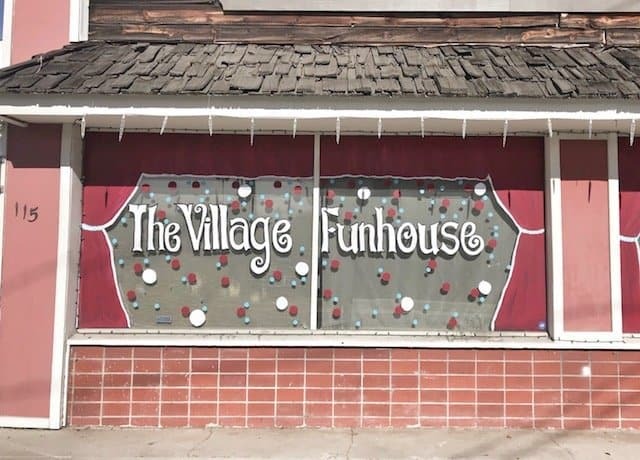 An indoor play place called The Village Funhouse. I brought my two-year-old daughter and four-month-old son to The Village Funhouse to play on Saturday morning. It’s a cute little building tucked away behind the Main Street that runs through Fallbrook, an unincorporated town in North County, San Diego. There are a few parking spots on the street and a big parking lot across from the entrance. You can’t miss the big colorful sign painted outside! What I loved most about this particular indoor play place is the small-town feel. It doesn’t have the shiny, noisy, commercial feel to it, like Chuck E. Cheese or similar places. It has a calm, colorful, simple vibe…and I love that. Y’all know my daughter is a fragile little soul that can’t handle all the noisy chaos and flashing lights of many popular indoor playgrounds. She’s introverted and skeptical, just like her mama. When you walk into The Village Funhouse, there’s a spot to remove your shoes and place your belongings, of course. And plenty of wet wipes and hand sanitizer. Something tells me they put those out specially for little ol’ me and my OCD…and I’m thankful for the extra step in sanitation. The lounge has comfy leather couches, a high chair for feeding your baby, and a large high-top table and chairs. Seriously, how many indoor playgrounds do you know of that have a secure feeding station for your small babies? Just for that, I’m going to say that this place rocks! And, if you’re a work-from-home parent that needs a place for your kids to burn off some energy while you work, this is the spot. You can sit at the lounge table with your tablet or laptop and work while your kids play (as long as they’re being supervised, of course). Free wi-fi, people. FREE Wi-Fi. This is a gated area with safe, soft learning toys for babies that can crawl. 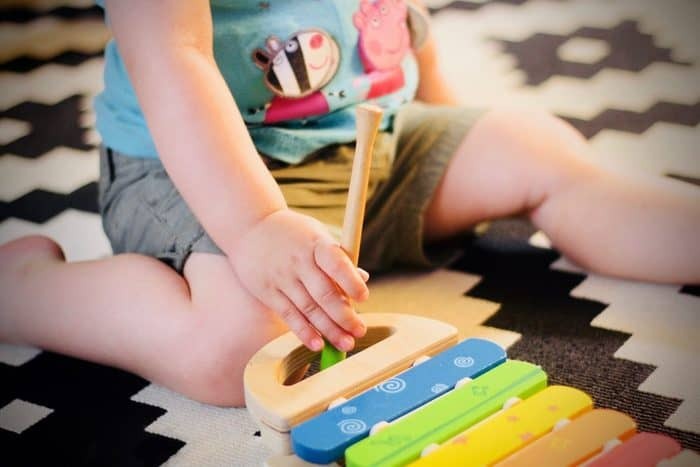 Baby slides, soft baby blocks, and sensory boards make Babyland super fun and unique. 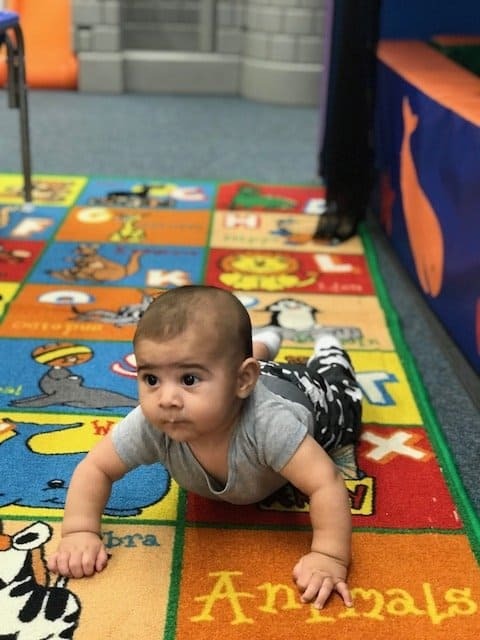 It’s ideally for small children that are learning to crawl or walk, but even my two-year-old loved it. 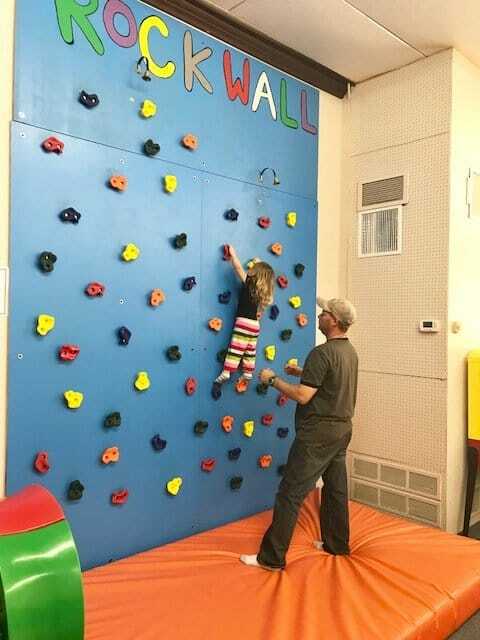 My babes aren’t quite ready for the rock wall, but I saw plenty of other kids climbing it and loving it. Even the owner’s little tot was able to climb all the way to the top and ring the victory bell! She might just be ready for American Ninja Warrior in a few years. 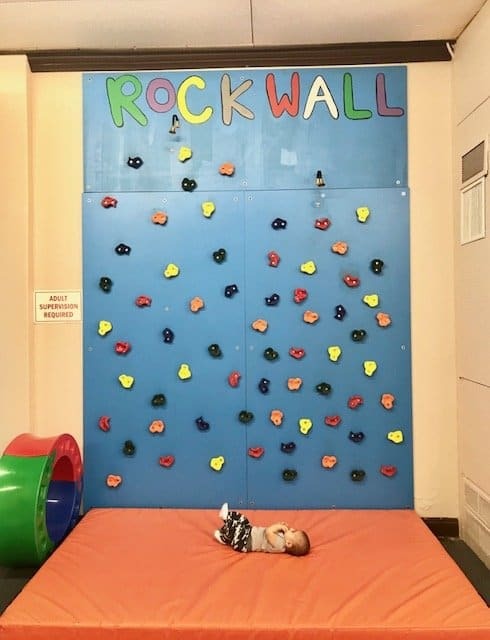 There’s an easy side and an advanced side, so kids of all ages can at least give the rock wall a try. There are four individual play “stations” within the fenced playground. 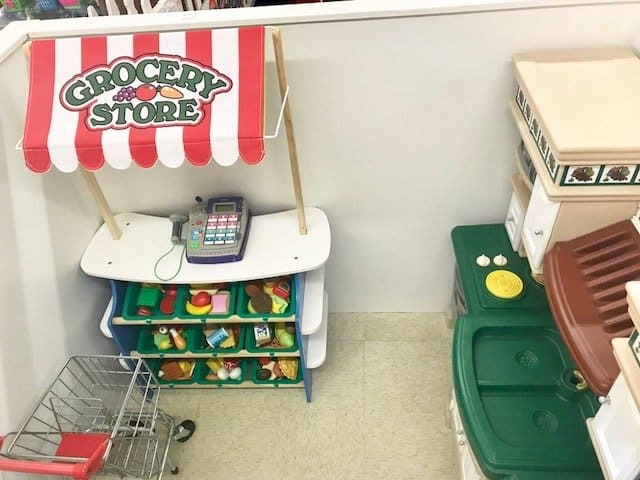 A grocery store, stocked with play food, grocery carts, cash register, etc. A working garage, stocked with play tools, a lawn mower, and a lazy boy chair. 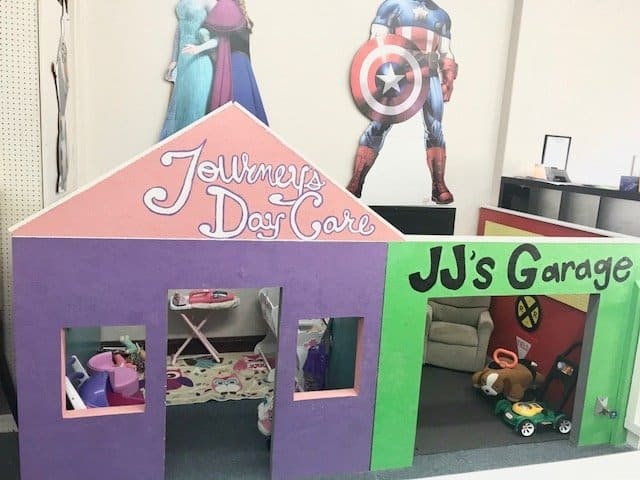 A day care, with baby dolls and cribs and strollers. And a costume room, filled with costumes for dress up! 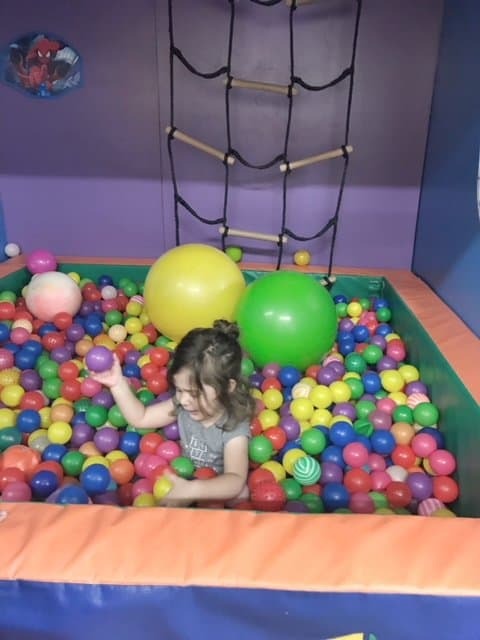 We didn’t even have time to play with everything, but it’s safe to say this particular indoor play place can keep your kids busy for HOURS. Beyond the enclosed play stations, you’ll find lots of space for open play and imagination. There are slides, tree houses, mini cars with tracks for driving, a ball pit, a trampoline, balancing beam, and a wooden railroad set. And that is just some of the stuff. 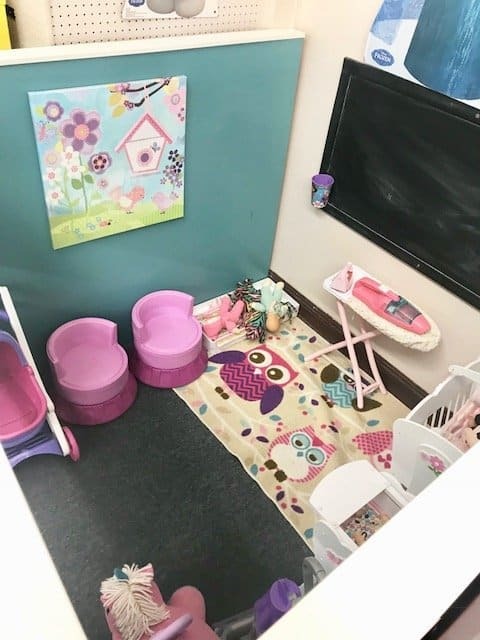 If you have older kids, you can find the video games and bean bag chairs in the far left corner of the room, away from the noisy littles, but close enough for mom to keep an eye out. Emma’s favorite spot was the ball-pit. She probably would’ve stayed there all day if I let her. What I love most is that parents can be present and interactive with their kids. The play structures are sturdy enough for adults. We climbed the tree houses and went down the slides and played in the ball pit. Tommy rolled around nearby while Daddy and I played with big sister. It was such a fun family day! There are a few other things that might not be a big deal to some moms, but they were a huge deal to me. One of these things being the clean bathrooms. 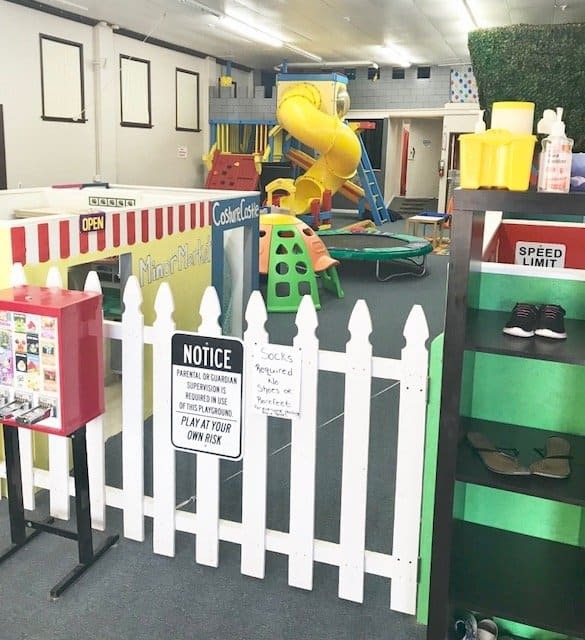 This particular indoor play place has two super clean bathrooms and a diaper-changing station. If you’ve ever struggled to change a baby’s poopy diaper on your lap, then you can probably appreciate the fact that there’s a clean baby changing station for moms with small babies. There is always fresh, complimentary coffee…you know, for moms like me that run on caffeine. You can also buy snacks, drinks, and extra socks if someone forgot theirs. I’m pretty sure that the owners thought of pretty much everything. 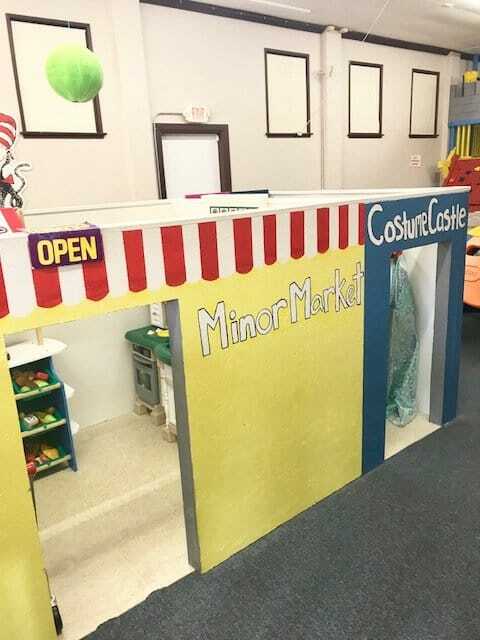 The Village Funhouse offers hourly rates, daily rates, and monthly rates. The package I want to highlight is their 3-month pass, which is the best deal you’re going to find for any place remotely like this one. This package gives you 3 months of unlimited access to The Village Funhouse for just $35 per month. 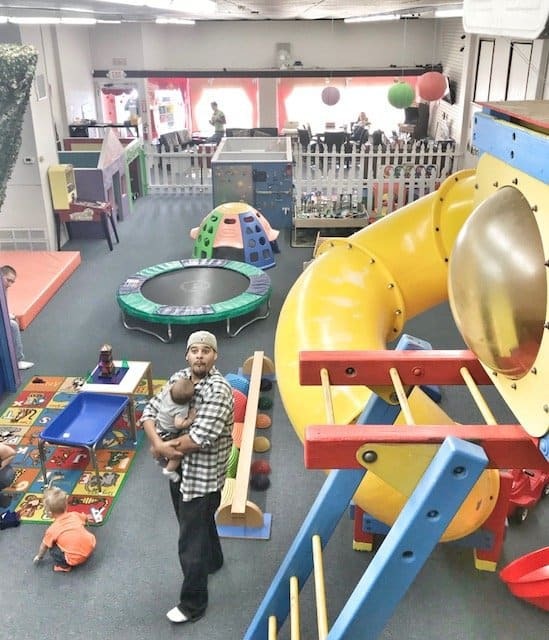 So, for just over a dollar a day, you can have unlimited access to the play place during their opening hours. Comfy lounge chairs, coffee, clean bathrooms, and free wi-fi for mom and dad. Fun games, new toys, and lots of exercise for your kids. You also get a discount on parties if you’re a pass holder, so it’s well worth it if you’re a local. There are more pricing and party details on The Village Funhouse website here. 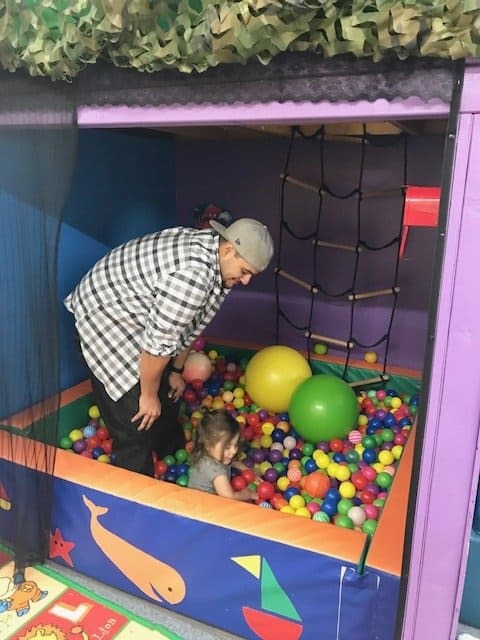 We had so much fun, taking a break from work and screens and just soaking up the quality time and imagination of this play place. If you’re looking for simple, inexpensive ways to entertain your kids with screen-free adventures, I encourage you to explore your local cities and find these hidden gems. They do exist. 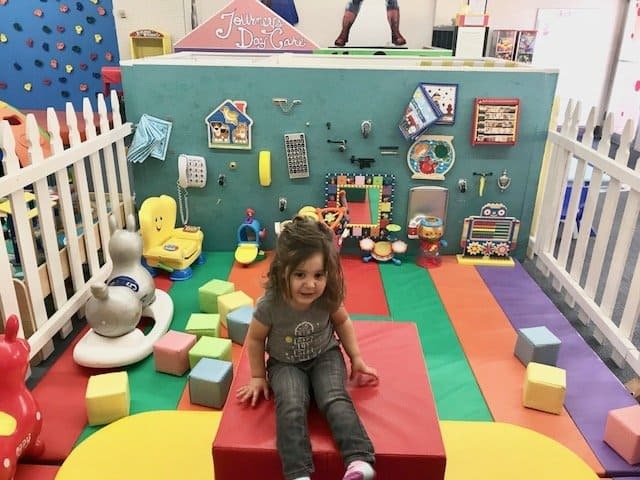 The Village Funhouse is just one awesome example of an adventure waiting for you and your family! If you’re a San Diego local, you absolutely have to check out this spot next time you’re in North County. Now, tell me! What are some fun spots in San Diego County that you have found for your family to enjoy?! If you’re not from around here, tell me about something cool you have found in your own city! Share in the comments. Oh my gosh! This looks like such a fun place! My littles would never want to leave. I think I’d have to pry Sadie out of the ball pit! I think I see a trip to San Diego in your future 🙂 The kids would love it! Hi Jan, thank you for your comment! First off, I just wanted to say thank you for taking the time to check out my site and subscribe to my list. Ads can get expensive fast, for sure, so I would focus my energy on areas that include free advertising, like your Facebook page, Facebook groups, and Twitter. Here is a good resource for improving SEO: https://ohsheblogs.com/seo-course-for-bloggers/ Your site looks good, there is just A TON of information and big words, and that’s a tad bit overwhelming. My only suggestion is to simplify things a bit. Shorter sentences, clearer call to action, LESS is more. I don’t do link shares unless they are VERY specific within my niche, which is for moms and mom bloggers. Link exchanges can improve SEO, but must be done properly to avoid being penalized by Google. You can also pre-register for my blogging course here: http://bit.ly/2Cj2vpo Have a great day!